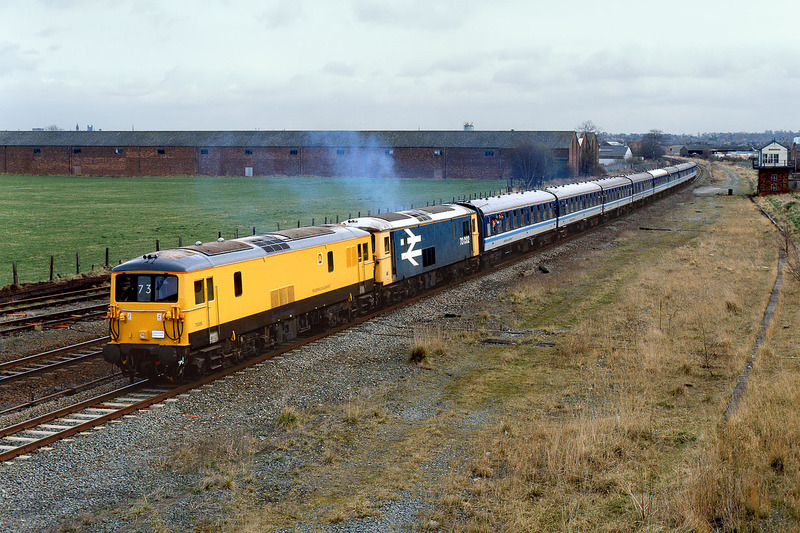 73006 & 73002 moved far from their former Southern Region home in 1993, when they were transferred to Merseyside to act as engineers and sandite locomotives, based at Birkenhead. 73006 soon acquired this bright new livery. On 12 March 1994 the pair worked the Regional Railways North West 08:15 Crewe to Blaenau Ffestiniog 'Jolly JAs' railtour between Chester and Llandudno Junction. They are pictured applying their combined 1200hp to move the nine coach train past Mold Junction. The tour also featured 31421 & 31455 from Crewe to Chester, between Llandudno Junction and Blaenau Ffestiniog, and on the return from Blaenau Ffestiniog. The tour's participants traveled over the Ffestiniog Railway behind Merrdin Emmrys, Castell Conwy & Linda.